David Wei (魏 资 容, Wei Zi Rong, "Wayfarer of Vast Capacity"), is a 16th generation lineage holder of Wudang Zhang San Feng Pai, and a global instructor of Wudang Daoist wellness arts and traditional Chinese acupressure massage. Under the direct guidance of Daoist priest, Master Yuan Xiu Gang, David completed over 11,000 hours of formal training at the Wudang Mountain Traditional Taoist Martial Arts Academy, China, in 2007, at which time he was accepted as a senior disciple. 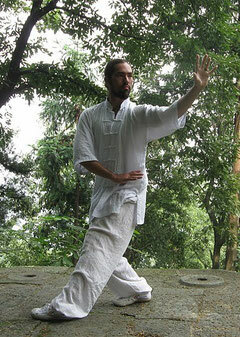 During those five years, David practiced internal martial arts, medical Qi Gong and meditation. While in Wudang, he also trained under Master Du Yi Jun, a highly-esteemed blind master of Tui Na medical massage. David then became a certified Wat Po therapist from Wat Po Temple in Bangkok, Thailand, building on his previous training in Tui Na, Zen Shiatsu, Acu-oil, and Lomi Lomi at the Acupressure Institute. Prior to Wudang, he trained in traditional Shaolin Gong Fu and classical Chinese brush painting with renowned Master Y.C. Chiang at Wen Wu School. David has since travelled globally, conducting workshop intensives in China, Thailand, Bali, Czech Republic, Sweden, England, Germany, Canada, Mexico, Hawaii, and across the U.S. In 2012, David founded the Wudang West Cultural Heritage Center, a 501(c)3 non-profit wellness ministry, based in Oakland, California, committed to the practice and preservation of classical Chinese healing arts.